The V-Tech Line Touring windshields manufactured by Puig it's been designed in a wind tunnel to improve the aerodynamic coefficient. Thanks to that, it's possible to decrement the pressure of the air against the biker when piloting. They have dimensions often bigger than the stock one that your motorcycle has and its angular shape direct the air to the sides of the biker besides giving it a more aggressive aesthetic. It complies with the ABE 38120 and TÜV approval that is why you will be able to pass the ITV without problems. 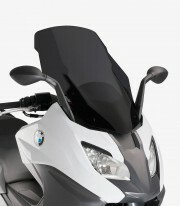 On average the aerodynamic of the bike is improved by 24% with the V-Tech Line Touring windscreens.